C. M. Johnson, P. H. Riley and C. R. Saha Thermo-acoustic engine converts thermal energy into sound energy by transferring heat between the working media. Download ppt "C. M. Johnson, P. H. Riley and C. R. Saha Thermo-acoustic engine converts thermal energy into sound energy by transferring heat between the working media." Score Stove Generating electricity in developing countries using thermo-acoustics powered by burning wood Bonjour Paris, Bonjour Madame et messieurs. Application of the Root-Locus Method to the Design and Sensitivity Analysis of Closed-Loop Thermoacoustic Engines C Mark Johnson. 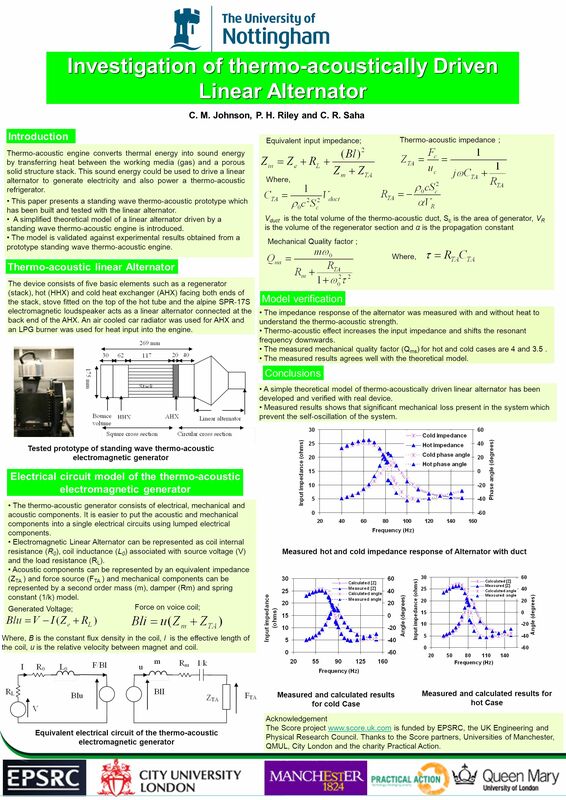 Analysis of the effects of different types of loads on a Thermo-Acoustic Engine Chitta Saha, Paul Riley and Mark Johnson. Testing of an integrated wood-fired cooking stove and thermo-acoustic engine-generator unit Ron Dennis Paul RileyProf Keith Pullen City UniversityUniversity. Investigating Electromagnetic and Acoustic Properties of Loudspeakers Using Phase Sensitive Equipment Katie Butler DePaul University Advisor: Steve Errede. Physics 12 Mr. Jean May 6 th, The plan: Video clip of the day AC/DC power generation AC/DC electric engines. Wave Energy Conversion Team: Andrew Cameron Brent MacLean Helen McDonald Steve McDonald Nicholas Smith Supervisors:Dr. Robert Bauer Dr. Larry Hughes Richard. Phy 213: General Physics III Chapter 30: Induction & Inductance Lecture Notes. Phy 103: Fundamentals of Physics Chapter 25: Electromagnetic Induction Lecture Notes. Signal and Systems Introduction to Signals and Systems.